Olga Anna Cain, a long-time resident of Maxwell. California was born January 12, 1923, in Jersey City, New Jersey. 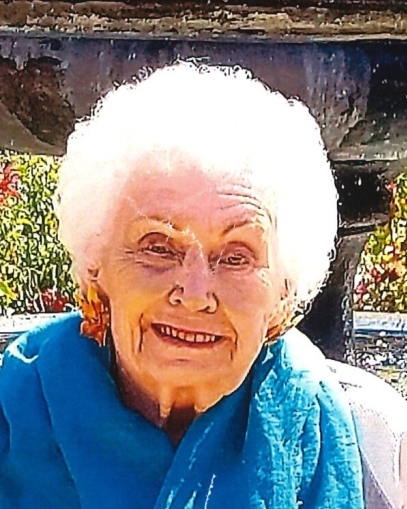 At the age of 95, she passed on November 23, 2018 in Rocklin where she moved to be closer to her family. Her mother, Anna, immigrated from Ukraine during the Bolshevik Revolution. Olga met the love of her life, George, at a USO dance while he was serving in the Navy. George succumbed to her beautiful green eyes, Roman nose, and high cheekbones. At that time, she was employed at Eastern Airlines. She took the giant leap of faith and moved to California to marry George. She received her PHTC (putting a husband through college) degree while he attended Berkeley and Davis on the GI bill. Together they raised three daughters and traveled the world. Olga was intelligent, energetic and enjoyed the arts. She took up oil painting, loved playing bridge and attending musicals and Live entertainment. She was involved with the Children’s Home Charity and served on the Colusa County Board of Education. She also set up a scholarship fund for high school students in George’s name. She is preceded in death by her husband George E Cain, mother Anna Kostiw, and brother Gene Kostiw. She is survived by her three daughters Patricia Cain of South Lake Tahoe, Jeanne Cain and her husband Craig Tourte of Rocklin and Kathleen Cain of Sacramento: grandson Hunter Tourte of New York City and nephew John Doud of Fortuna, James Doud of San Leandro, nieces, Janice Doud Santiago of Portland Oregano and Joyce Beedle and husband Chris of Kansas City. Memorial donations may be made in Olga’s name to the Maxwell Volunteer Fire Department, Maxwell Cemetery, Friends of Colusa County Animal Shelter or to the charity of your choice.